Tecsour professional services is a leading Web Designing and Development company which serves more than 100 local clients across India for various projects and services. With the growth of the firm we have also increased the scope of our services and offer our fortune clients. The charges which we provide for any of services whether it is web designing, web development, SEO, PPC or content writing are defined in the project quotations which are received by the clients via email. The quotation which we provide lasts for a period of 30 days. After this Tecsour Infoserv Private Limited have full rights to alter or decline them to provide a quotation after expiry of 30 days. Tecsour Infoserv Private Limited provides its clients with opportunity to review the contents, website during the designing phase and at the time when the website development get completed. After the project gets completed it will be believed that the project has been accepted till the client does not notified Tecsour Infoserv Private Limited within 10 days of delivery. Tecsour Infoserv Private Limited provides you with the invoices when after the website publish, and after every month for SEO. The invoice is sent via emails however the clients may choose their hard copy of invoices. The invoice gets due upon receipt, if it remains unpaid for thirty (30) days after the date of invoice then a service charge will be added to the amount by 1 to 1 ½ half percent or £30 per month of the total due amount. 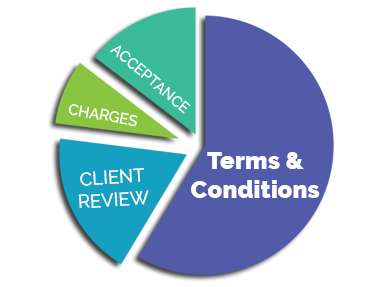 If the client agrees to pay back Tecsour Infoserv Private Limited for any additional expenses for completion of the work, for example additional of some other features in the web designing or marketing packages. Sometimes Tecsour Infoserv Private Limited may purchase the domain names on the behalf of the clients but it is not our responsibility to renew the domain names as it is the responsibility of the client. If there is any loss of cancellation of the domain due to any late payment then we are not responsible for the same. The clients need to keep the records of the due date of payment so that payment is received in time.